Superb Italian fabric with mastered cut. 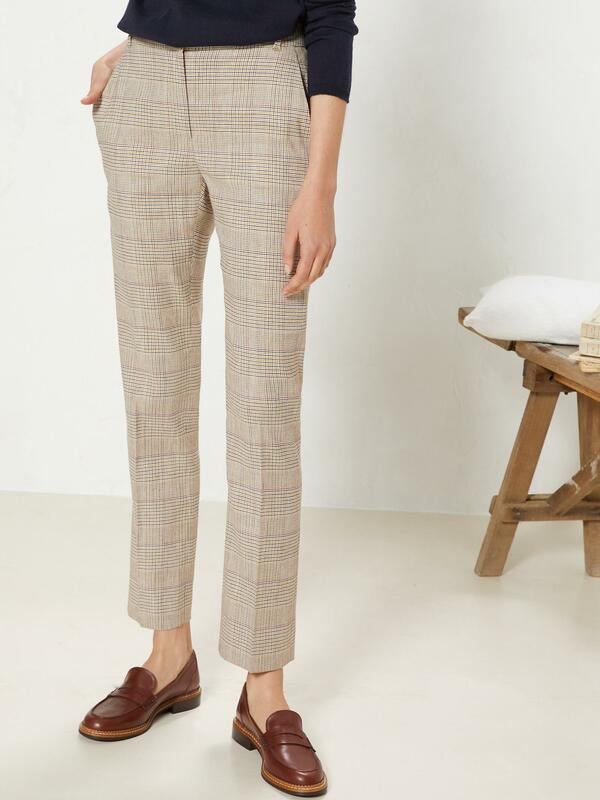 The cigarette trousers display a summery and trendy Prince of Wales check with a touch of honey. To wear with the matching jacket? Cigarette leg, tapered, and cropped (7/8 length). High waist. Waistband with belt loops, zip, and button fastening. 2 slant pockets. Mock piped pockets at back. Marked pleat front and back. Inseam 71cm, leg width 18.2cm approx. Italian Nalya* fabric, 57% linen, 40% cotton, 3% elastane. *Renowned specialist in natural textiles, noble fibres, and innovative fabrics in woven-dyed solids.